Objective. To compare live birth rates in women with recurrent pregnancy loss (RPL) and either autoantibodies or a coagulation abnormality, treated with low molecular weight heparin plus aspirin (LMWH/ASA) or ASA alone, and to place our results in context with other randomized clinical trials (RCT) with similar cohorts. Methods. The HepASA Trial was an RCT including patients with a history of RPL and at least 1 of the following: antiphospholipid antibody (aPL), an inherited thrombophilia, or antinuclear antibody. Treatment groups were stratified by aPL status and history of early versus late pregnancy losses. Patients received either LMWH/ASA or ASA alone. The primary outcome was live birth; secondary outcomes included adverse events and bone loss at the spine and femoral neck. Literature over the past 20 years was reviewed to identify comparable RCT. Results. Over 4 years, 859 women with RPL were screened: 88 (10.2%) fulfilled inclusion criteria, became pregnant and were randomized to receive either LMWH/ASA or ASA alone. aPL were present in 42 (47.7%) patients in each group. The trial was stopped after 4 years when an interim analysis showed no difference in live birth rates in the 2 groups, and a lower rate of pregnancy loss in the ASA only group than expected. In the LMWH/ASA group, 35/45 (77.8%) had a live birth versus 34/43 (79.1%) in the ASA only group (p = 0.71). Neither number of prior losses nor aPL status was correlated with pregnancy outcome. There were no cases of pregnancy related thrombosis in either group. Mean change in BMD did not differ by treatment group at either the lumbar spine (p = 0.57) or femoral neck (p = 0.15). RCT since 2000 for aPL positive women with RPL and similar inclusion criteria report a mean live birth rate of 75% with either LMWH or ASA. Conclusion. LMWH/ASA did not confer incremental benefit compared to ASA alone for this population. Regardless of treatment regimen, number of prior losses, or aPL positivity, almost 80% of women in our RPL cohort had a successful pregnancy outcome. These findings contribute to a growing body of literature that contests the emerging standard of care comprising LMWH/ASA for this population. Approximately 15% of all clinically recognizable pregnancies end in pregnancy loss1,2, and it has been estimated that recurrent pregnancy loss (RPL) affects up to 5% of couples trying to conceive3. A patient who has had 2 or more consecutive losses can be classified with RPL4. Possible causes to consider in evaluating RPL include anatomical, genetic, and hormonal factors, but in over 50% of cases no etiology is found5. Pregnancy loss in patients with antiphospholipid antibodies (aPL) including anticardiolipin (aCL) and the lupus anticoagulant (LAC) has been attributed to placental infarcts and vascular thrombosis leading to placental insufficiency6,7. Others have observed an inhibition of trophoblast invasion and differentiation as a possible mechanism for early pregnancy loss8,9. The role of an immunemediated mechanism to explain RPL has been examined based on observations initially made in women with systemic lupus erythematosus (SLE), an autoimmune disease that can be accompanied by higher than normal rates of fetal loss10. Certainly, the deposition of immunoglobulins, complement, anti-DNA antibodies, and antinuclear antibodies (ANA) in the lupus placenta suggest that coagulopathy is not the only mechanism of placental (and therefore fetal) ischemia, and that immune-mediated inflammatory mechanisms may also contribute to intrauterine growth restriction (IUGR) and fetal loss11. The present standard of care for women with aPL and RPL is treatment with heparin and aspirin (ASA)12. Early data supporting the use of ASA and unfractionated heparin to improve live birth rate in women with RPL and aPL appeared in 2 small studies in the 1990s13,14. Rai and colleagues14, in determining the required sample size for their randomized trial, predicted rates of loss with ASA alone that were significantly higher than observed by others both before and since15–17. They included women with very low levels of aPL, and found a decrease in early fetal loss with the use of unfractionated heparin and ASA compared to ASA only. They also reported no treatment benefit for pregnancies that survived beyond 13 weeks’ gestation, a finding not supported by others18. In a more recent randomized clinical trial (RCT), Farquharson, et al found no improvement in pregnancy outcomes of aPL positive women with a history of RPL when comparing treatment with low molecular weight heparin (LMWH)/ASA vs ASA alone17 and Carmona, et al found that preconceptual ASA treatment was an independent predictor of live birth19. Subsequent to the design and initiation of our HepASA trial, Empson, et al20, in a Cochrane database review, concluded that treatment with unfractionated heparin and ASA may reduce pregnancy loss by 54% but that large randomized controlled trials are still needed to explore potential differences between unfractionated heparin and LMWH. A relationship between inherited and acquired thrombophilias and RPL has been examined, with small uncontrolled studies favoring treatment with LMWH to improve pregnancy outcome21–23, but evidence supporting this treatment remains inadequate24. A recent systematic review concluded that owing to limited evidence of efficacy, treatment with LMWH/ASA remains empiric in women with inherited thrombophilias25. As previous studies of these therapeutic regimens have not proven conclusive due to small sample sizes and/or weak study design, we undertook a randomized controlled trial of LMWH and ASA versus ASA alone for women with prior adverse obstetric outcomes, autoantibodies including aPL, and inherited thrombophilias, commencing randomization early in the first trimester. The primary objective of the HepASA Trial was to investigate whether treatment with LMWH plus ASA results in an increased rate of live births compared to treatment with ASA alone. The secondary objective was to compare adverse events and the incidence of bone loss in the 2 groups. In addition, we wanted to place our findings in the context of other comparable trials and determine why, in the apparent absence of consistent findings, a standard of care has emerged for this population. In this open label RCT, we investigated whether treatment with LMWH/ASA results in increased live births in women with a history of consecutive RPL and autoantibodies compared to treatment with ASA alone. Inclusion criteria: Women considered for participation in this trial fulfilled the following criteria: aged 18–44 years at the time of randomization; a history of ≥ 2 unexplained consecutive pregnancy losses prior to 32 weeks gestation; presence of at least 1 of the following: ANA, aPL, or an inherited thrombophilia; and confirmed pregnancy by either 2 appropriately rising quantitative beta human chorionic gonadotropin (ßhCG) tests performed 48 h apart or by ultrasound confirming fetal heart activity. Exclusion criteria: Exclusion criteria included SLE (fulfilling American College of Rheumatology classification criteria26), known peptic ulcer disease (within the last 5 yrs), sensitivity to ASA or heparin obtained by self report, bone mineral density z score < –2.5, known platelet function abnormality, or a previous thromboembolic event (TE) requiring ongoing anticoagulant therapy including heparin, ASA, or warfarin, verified in medical records. Patients were also excluded if any genetic, anatomic, or hormonal etiology for pregnancy loss was identified by (respectively) karyotype analysis of both partners, hysterosalpingogram/sonohystogram, and a hormonal evaluation (which included either an endometrial biopsy or loss while taking progesterone or clomiphene therapy or mid luteal phase serum progesterone levels timed appropriately). Any such patient was referred for appropriate counseling or treatment. Geographic distance from the clinic and hospitals in Toronto/Hamilton, Ontario, as well as failure to consent to participate were additional exclusion criteria. Laboratory evaluation: Positive serology was defined as at least one of the following tests found to be positive on 2 occasions at least 8 weeks apart: anticardiolipin IgG [> 15 IgG phospholipid units (GPL)] or IgM [> 25 IgM phospholipid units (MPL)]; LAC measured by Russell’s viper venom time (RVVT), kaolin-cephalin clotting time (KCCT), dilute prothrombin time (DilPT), or lupus sensitive activated partial thromboplastin time (aPTT-LA)27; or the presence of 1 positive test on a thrombophilia screen [which included protein C (functional), protein S (free) antigen functional, activated protein C resistance (APCR) assay, factor V Leiden, prothrombin 20210 AG, and methylenetetrahydrofolate reductase (MTHFR)]; or ANA ≥ 1/80. All eligible patients signed consent to participate at the pretrial visit and again at randomization once confirmed pregnant. Clinical assessments: A study physician evaluated all randomized women every 6 weeks during their pregnancy. The assessment included a general examination preceded by a detailed history including a functional inquiry assessing for the presence of a systemic autoimmune disorder. Platelets were measured 6 to 12 days after beginning LMWH and every 6 weeks thereafter. Partial thromboplastin time (PTT) was measured at each visit. Obstetrical evaluations were performed according to accepted standard of practice. Data were collected at the obstetrical visits to document fetal development and well-being as well as maternal complications. Delivery information was obtained from the obstetrician or from medical records. Patients were seen 6 weeks post partum and had a bone mineral density (BMD) performed 6–12 weeks’ post partum. Spine (L2–L4) and hip (femoral neck) BMD were measured in g/cm2 by dual energy x-ray absorptiometry using a Lunar DPX-L bone densitometer (Lunar Corporation, Madison, WI, USA). Measurements throughout the trial were performed by a single, certified densitometry technician. The coefficient of variation determined by test-retest with repositioning was 1.18% at the spine and 1.56% at the femoral neck. Adverse events: Side effects were recorded at each visit by the study physician using a standard questionnaire. BMD was assessed prepregnancy and 6–12 weeks at a single laboratory by a single technician to allow quantification of the effect of LMWH on BMD as well as to determine the effect of pregnancy on BMD in the ASA only group. The trial drug, LMWH (Fragmin, dalteparin sodium), was provided by Pfizer (formerly Pharmacia and Upjohn) as a solution for injection with potency described in international anti-Xa units (IU) and supplied in multidose vials (25,000 anti-Xa IU/ml). All patients randomized to receive LMWH were taught to self-inject the medication subcutaneously once daily until 35 weeks’ gestation or delivery, at a dose of 5000 IU/day. ASA (81 mg enteric coated) was used in combination with LMWH in the investigational group, and ASA alone was administered in the reference group. Medication compliance was measured at each clinical visit by patient self-report and return of used LMWH vials. The sample size estimate was based upon an expected live birth rate of 50% in the ASA-treated patients derived from the live birth rate in the placebo arm of the ASA/P study15. A 25% absolute improvement in live birth rate with LMWH/ASA treatment was hypothesized14. The sample size was based on the number needed to show a significant difference in proportions, with a 2-sided alpha of 0.05 and a beta of 0.10, and was calculated to be 90 patients per group (180 patients in total). We assumed a 10% dropout rate, resulting in a planned sample size of 200 with an accrual rate of 50 per year for the 4-year funding period. An interim analysis was built into the study design to occur once 90 patients were randomized. The randomization schedule was created by the Coordinating and Methods Centre (CMC) of McMaster University in Hamilton. Randomization was performed at the CMC, with communication by telephone, when an eligible patient was confirmed pregnant. Patients were randomized to receive prophylactic doses of LMWH and ASA or ASA only. The CMC assigned a study number to the patient and provided treatment allocation data to the study coordinator. Patients were stratified by presence or absence of aPL, and early (≤ 14 wks) versus late (15–32 wks) losses. The rationale for stratification was to enable subgroup analysis of aPL positive women, who may have a different risk or poorer outcomes than the other women included in this study. Women with a history of both early and late losses were assigned to the late stratum. The trial was an open label design, as the investigators did not consider daily subcutaneous placebo injections to pregnant women ethical; further, ascertainment of the primary endpoint (live birth) should not be subject to bias as a result of knowledge of treatment strategies. We also examined safety variables including adverse events and changes in BMD. The primary analysis was “intent to treat” based on stratified logistic regression with an adjustment for age and timing of losses as well as the treatment variable. The trial design planned for a multivariate analysis, permitting subgroup analysis paying attention to antibody profiles, early and late losses, maternal age, and side effect profiles. Mean change in BMD from baseline to followup was compared by treatment group using a Student’s t test. Participants were classified as having experienced bone loss at the spine and femoral neck separately based on the estimated least significant change. Logistic regression was used to examine the effect of treatment group on BMD loss for the spine and femoral neck separately. Statistical analysis was performed using SAS (Version 9.1). Our study was approved by the University of Toronto Ethics Review Board, Toronto, and by the Ethics Review Board at McMaster University (ClinicalTrials.gov registration number NCT00564174). A total of 859 women were screened for inclusion in the HepASA trial between 2000 and 2004 (Figure 1). From the panel of laboratory markers tested, 266 women (31%) had at least 1 positive result. One hundred eighty-three of the positive patients completed the required gynecologic tests, and 112 of these patients consented to participate once they became pregnant. Twenty-four failed to conceive during the study period and 88 patients were randomized (10.2% of the total screened): 43 patients to receive ASA only and 45 to receive LMWH/ASA. CONSORT flow chart for recruitment to the HepASA trial. Figure 1 summarizes study recruitment. Baseline patient characteristics are summarized in Table 1. There were no significant differences between the 2 groups in demographic characteristics, obstetric history, mean age at randomization (33.8 vs 34.6 yrs), or laboratory profile. Forty-two patients (47.7%) of those randomized were aPL positive (25 for IgG; 6 for IgM; 15 for LAC; and some patients for more than 1 aPL) and 22% had one of the panel of thrombophilia markers tested, all heterozygous. Baseline patient characteristics of the 2 treatment groups. Our study was designed to have a sample size of 200 patients and we had anticipated completion within the 4-year funding period. However, after 4 years of recruitment and screening 859 women, only 88 patients had been randomized (Figure 1). The steering committee decided to end the trial upon completion of the 4-year funding period when it was revealed that an interim analysis showed no significant difference in pregnancy outcome between the groups. In addition, the pregnancy loss event rate in the ASA only group was much lower than originally hypothesized. There were 35 (77.8%) live births in the LMWH/ASA group and 34 (79.1%) live births in the ASA only group (p = 0.75 by Fisher’s exact test, Table 2). There was no association between number of previous pregnancy losses (2 vs ≥ 3) and pregnancy outcome: relative risk (RR) 0.70; 95% confidence interval (CI) of RR: 0.40–1.22 (p = 0.20). Mode of delivery was similar in the 2 groups: RR 1.04; 95% CI 0.77–1.41 (p = 0.80). One patient in the ASA only group had a twin pregnancy that resulted in 1 live birth and 1 stillbirth. Thus the total number of outcomes in the ASA only group was 44. A neonatal death occurred in the ASA group, attributed to cervical incompetence, preterm premature rupture of membranes, and delivery at 22 weeks’ gestation (with the neonate living for less than 1 h). Spontaneous abortions ≤ 14 weeks’ gestation occurred in 7 (15.5%) of the LMWH/ASA pregnancies and in 8 (18.6%) of the ASA only pregnancies with the mean (range) gestational age at the time of loss being 9.8 (7.7–10.7) weeks versus 8.9 (5.9–13.0) weeks, respectively. There were no pregnancy losses between 15 and 20 weeks’ gestation. Pregnancy outcome stratified by treatment group. Data are presented as n (%). There were no statistically significant differences between the 2 treatment groups with regard to obstetrical outcomes. There was 1 twin pregnancy in the ASA only group, resulting in 44 pregnancy outcomes from 43 pregnancies. The median birth weight in the LMWH/ASA group was 3404.5 grams (g) and 3250 g in the ASA only group (p = 0.627). Birth weights were below the 10th percentile based on Canadian census data28 in 9 patients (including 1 twin stillbirth), with 3 in LMWH/ASA group and 6 in the ASA only group. Placental maturation was noted in one of these patients and increasing blood pressure in another, both resulting in the decision to induce labor. Obstetric histories of early versus late loss were not associated with any difference in the live birth rate in the 2 groups (Figure 2). Of the 11 patients with a history of stillbirth, none had a late pregnancy loss or stillbirth in the study pregnancy: 7 had a live birth; 4 had early pregnancy losses. Three of the 7 live births occurred among the 9 patients with a birthweight less than the 10th percentile. 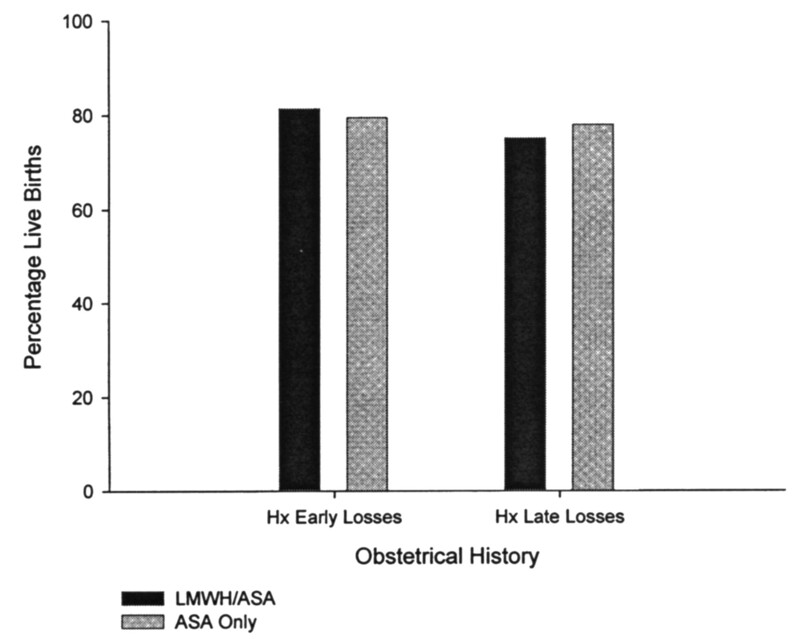 Comparison of pregnancy outcomes for treatment groups with history of early versus late losses. Stratification by presence or absence of aPL at randomization resulted in 22 aPL positive patients randomized to LMWH/ASA (48.9%) and 20 randomized to ASA (46.5%) (Table 1). Table 3 summarizes pregnancy outcome based on aPL presence and treatment group. No significant difference was detected with respect to pregnancy outcome. Live births were evenly distributed across GPL and MPL titers in both treatment groups, but the sample sizes were too small to enable any conclusions regarding the significance of that observation. There were no cases of a maternal thromboembolic event either during pregnancy or in the postpartum period in either group. Pregnancy outcome stratified by presence or absence of antiphospholipid antibody (aPL) and treatment group. Of the 88 trial participants, 23/45 randomized to LMWH/ASA and 15/43 randomized to ASA alone completed both baseline and followup BMD assessments. For these 38 women, the mean duration of time between assessments was 1.35 years (0.84–2.82 yrs) and was similar for the 2 groups (p = 0.18). Mean change in BMD for the 38 women was –0.05 g/cm2 at the spine (range –0.30 to 0.07) and –0.01 g/cm2 at the femoral neck (range –0.16 to 0.115). Mean change in BMD did not differ by treatment group at either the lumbar spine (p = 0.57) or femoral neck (p = 0.15). Twenty-eight of the 38 women with complete BMD data experienced significant loss of bone mass over the intervening period at 1 or both of the lumbar spine or femoral neck; 27 of the 28 experienced loss at the spine, and 13 of the 28 experienced loss of bone mass at the femoral neck. The odds of loss of bone mass were not significantly different for those in the LMWH/ASA group compared with those in the ASA alone group [odds ratio, OR (any loss) = 0.97, 95% CI 0.22 – 4.24, p = 0.97; OR (spine loss) = 0.71, 95% CI 0.17–2.92, p = 0.63; and OR (hip loss) = 2.33, 95% CI 0.57–9.29]. The HepASA trial, comparing LMWH/ASA and ASA alone in women with RPL, did not show any demonstrable difference in the rate of live births in the 2 groups. Our results add to the body of literature16,17 suggesting that use of heparin plus ASA in women with RPL may not be as beneficial as originally suggested13,14. There were no major adverse events associated with either treatment. One stillbirth did occur in each treatment arm and the only neonatal death occurred in the ASA only group, associated with cervical incompetence and preterm premature rupture of membranes at 22 weeks’ gestation. Two subgroups included in HepASA have been the subject of much discussion. The study was stratified by presence of aPL, as this population has been included in many previous studies. Although our final sample size resulted in lower than the desired statistical power, the subgroup of women with aPL did not appear to benefit from the use of LMWH plus ASA (Table 3). Unfortunately, although aCL titers and live births in our aPL positive women were evenly distributed between the 2 treatment groups, the sample size was not sufficient to enable any conclusions to be drawn with regard to titer-based treatment efficacy. Of patients screened for this trial, the number positive for aPL was 31% (256/859), which was lower than our previous experience15, and as not all of these women satisfied our inclusion/exclusion criteria, we concur with the findings that approximately 20% of women with RPL have aPL29. The data collected in this study did not show evidence that LMWH use was associated with increased bone loss versus the ASA group. The safety of LMWH in pregnancy has been described by others30,31 and bone loss appears to be similar for women on LMWH or on unfractionated heparin32. Both pre- and post-BMD measurements were obtained in 54% (38/70) of the patients with live births. We surmise that as our patients come from a wide radius around Toronto, the followup BMD appointment at the reference laboratory, located downtown, may have been difficult to attend despite our efforts to accommodate schedules. Additionally, since a number of our patients became pregnant very quickly after their successful pregnancy in this trial, they may not have undergone postpartum BMD if they were already pregnant. We included women with a history of 2 or more consecutive first trimester pregnancy losses, as we and others have noted that the causes of RPL are similar in women with 2 or 3 losses33. We support investigation and, if appropriate, treatment of women with RPL after 2 consecutive losses rather than after a third loss4. Indeed, our analysis of women randomized in this trial showed that pregnancy outcome in those with a history of 2 versus 3 or more previous pregnancy losses did not differ. It is also interesting to note that a history of early versus late loss did not affect the live birth rate in either of the 2 groups (Figure 2). Our study has a number of weaknesses that must be noted. This was an open label RCT. Patients were blindly randomized through a centralized methods center upon pregnancy confirmation, but they were then made aware of the group to which they were assigned. When designing the study, it was decided that the objective outcome of our study, live birth rate, combined with the ethical concern of subjecting pregnant women to daily placebo injections, warranted an open label design. Our inclusion of women positive for a broader panel of autoantibodies and not exclusively aPL may also be controversial. However, since RPL is a feature of SLE regardless of aPL positivity34, we consider it appropriate to test for a broader spectrum of autoantibodies in women who are presenting with RPL in the absence of a connective tissue disease. Moreover, it is emerging that in patients with primary antiphospholipid syndrome, there may be an inflammatory component to the RPL35, with an etiology that has yet to be elucidated. An interim analysis built into the original design was to occur after 90 patients were randomized. However, accrual was much slower than anticipated, and at the end of 4 years, despite screening over 800 patients, only 88 patients had been randomized. The study steering committee, based on results of an interim analysis on the first 88 patients, decided to end the trial at the end of the 4-year funding period. The pregnancy loss event rate was much lower in the ASA only group than originally hypothesized and there was no difference in live birth rate in the 2 treatment groups. It was clear that a much expanded sample size would be necessary to detect a difference between the 2 arms and would require screening thousands more patients. Our experience highlights the difficulty in recruiting RPL patients with autoantibodies and inherited thrombophilias into clinical trials and suggests that investigators studying this population need to carefully consider feasibility and multicenter collaboration. Despite the high referral rate to our center (> 200 patients/yr), it was not feasible to fulfill enrollment in an appropriately-powered decisive trial in 4 years. We recognized the need for collaborators early on but it proved difficult to find centers willing to participate. Some potential collaborators who treat women with RPL were uncomfortable with the trial inclusion of an ASA only treatment arm, as they felt it inappropriate to withhold heparin from aPL- or inherited thrombophilia-positive patients. Literature available at the time of trial design suggested a much higher incidence of inherited and acquired thrombophilias in women with RPL19 than we have subsequently reported36. Although the association of thrombophilias with RPL has been confirmed in 2 metaanalyses37,38 data supporting recommendations to treat with anticoagulants remain limited24, and the small sample size of patients with thrombophilias in each of our study groups did not permit statistically valid comparison of treatment efficacy. There have been a number of RCT for patients with RPL with aPL evaluating either unfractionated (UFH) or LMWH (Table 4) over the past 15 years. Each trial determined its own aPL inclusion criteria; for example, cutoffs for aCL IgG levels varied from a low of 514 to a high of 3039 GPL, and each center measured LAC by different methodologies, and intuitively, these design inconsistencies might be expected to result in differential outcomes. However, regardless of differences in aPL status among the various trials, the live birth rates, whether in the UFH or LMWH treatment groups, are similar, ranging from 71.1% to 84%, with a weighted mean of 77.0% (standard deviation: 4.1). The only significant differences among trial outcomes are in the ASA-only treatment arms (Table 5): the live birth rates in those vary from a low of 42.2%14 to a high of 80.0%16. Interestingly, both the lowest and the highest birth rates with ASA only treatment occurred in the trials with the lowest cutoff for aCL positivity, and the second lowest birth rate occurred in a trial that excluded LAC positive patients altogether13. The 2 trials with the lowest birth rates with ASA only treatment13,14 were among the earliest completed with this population, and were also among those few that have reported a significant benefit for heparin and ASA over ASA alone. Their findings helped to establish the current standard of care that continues to recommend the use of LMWH/ASA for women with RPL and aPL. Comparison of live birth rates for women with recurrent pregnancy loss and aPL. Results from 8 randomized clinical trials from 1996 to 2008 evaluating either unfractionated heparin or low molecular weight heparin in combination with aspirin. Comparison of studies with ASA only treatment arms for aPL positive patients with recurrent pregnancy loss. However, the results from our HepASA trial add to a growing body of evidence reported since 200016,17,40,41 that does not support the use of LMWH plus ASA over ASA alone in this population. We agree with Gates, et al42, who concluded after a thorough literature review, that for women with aPL, RPL, and no prior history of thrombosis, there is insufficient evidence to base recommendations for thromboprophylaxis in pregnancy. We thank Louise Woods for her assistance in coordinating this study and Shafagh Fallah for her assistance in the statistical analysis. Supported by Canadian Institute of Health Research (CIHR) Rx&D grant (PCT 37749) and by a grant from Pfizer Canada (formerly Pharmacia, Canada). LMWH was supplied by Pfizer Canada.
. Incidence of early loss of pregnancy. N Engl J Med 1988;319:189–94.
. Intravenous immunoglobulin treatment for recurrent abortions caused by antiphospholipid antibodies. Fertil Steril 1991;56:1013–20.
. Evaluation and management of recurrent early pregnancy loss. Clin Obstet Gynecol 2007;50:132–45.
. ACOG Practice Bulletin 24. Management of recurrent early pregnancy loss. 2002 Compendium of Selected Publications. Washington, DC: American College of Obstetricians and Gynecologists; 2001:372–83.
. Pregnancy in systemic lupus erythematosus. Rheum Dis Clin North Am 1988;14:169–85.
. Pregnancy loss in antiphospholipid antibody syndrome – a possible thrombogenic mechanism. N Engl J Med 1997;337:154–60.
. Decidual vasculopathy and extensive placental infarction in a patient with repeated thromoboembolic accidents, recurrent fetal loss and a lupus anticoagulant. Am J Obstet Gynecol 1982;142:829–34.
. Defective endovascular trophoblast invasion in primary antiphospholipid antibody syndrome-associated early pregnancy failure. Hum Reprod 2002;17:1067–71.
. Antiphospholipid antibodies prevent extravillous trophoblast differentiation. Fertil Steril 2005;83:691–8.
. The fetus in systemic lupus erythematosus. In: Wallace DJ, Hahn B, Hahn BH, Dubois EL, eds. Systemic lupus erythematosus. Vol 7. Lippincott-Williams: 2006:1039–57.
. Treatment of pregnancy loss in Hughes syndrome: a critical update. Autoimmun Rev 2002;1:298–304.
. Antiphospholipid antibody-associated recurrent pregnancy loss: treatment with heparin and low dose aspirin is superior to low dose aspirin alone. Am J Obstet Gynecol 1996;174:1584–9.
. Randomized controlled trial of aspirin and aspirin plus heparin in pregnant women with recurrent miscarriage associated with phospholipids antibodies. BMJ 1997;314:253–7.
. Prednisone and aspirin in women with autoantibodies and unexplained recurrent fetal loss. N Engl J Med 1997;337:148–53.
. Does aspirin have a role in improving pregnancy outcome for women with antiphospholipid antibody syndrome – A randomized clinical trial. Am J Obstet Gynecol 2000;183:1008–12.
. Antiphospholipid syndrome in pregnancy: A randomized controlled trial of treatment. Obstet Gynecol 2002;100:408–13.
. Maternal circulation in the first trimester human placenta-myth or reality? Am J Obstet Gynecol 1997;176:695–705.
. Risk factors associated with fetal losses in treated antiphospholipid syndrome pregnancies: a multivariate analysis. Am J Reprod Immunol 2001;46:274–9.
. Prevention of recurrent miscarriage for women with antiphospholipid antibody or lupus anticoagulant. Cochrane Database Syst Rev 2005;CD002859.
. Increased fetal loss in women with heritable thrombophilia. Lancet 1996;348:913–6.
. Inbal A. Thromboprophylaxis improves the live birth rate in women with consecutive miscarriages and hereditary thrombophilia. J Thromb Haemost 2003;1:433–8.
. Effects of enoxaparin on late pregnancy complications and neonatal outcome in women with recurrent pregnancy loss and thrombophilia: results from the Live-Enox study. 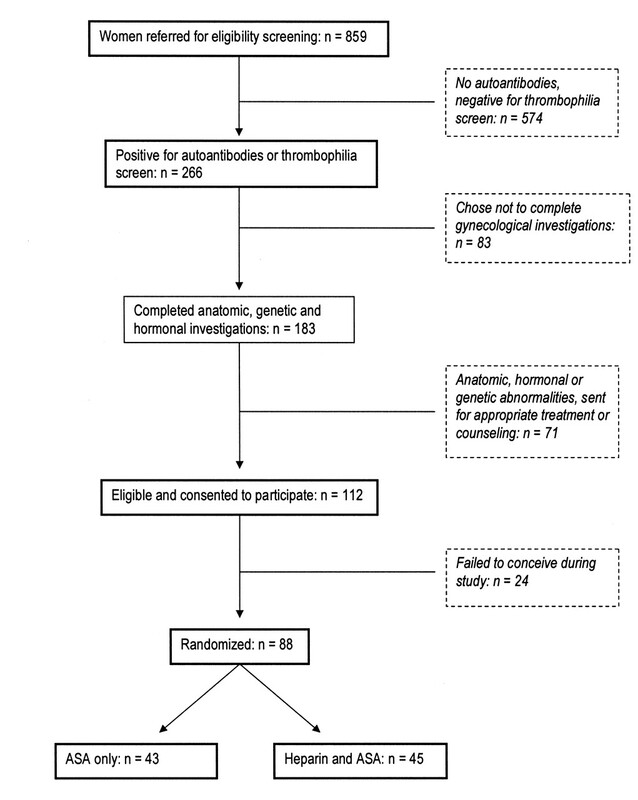 Fertil Steril 2005;84:770–3.
. Thrombophilia and pregnancy complications: cause or association? J Thromb Haemost 2007;5 Suppl276–82.
. Anticoagulants for the treatment of recurrent pregnancy loss in women without antiphospholipid syndrome. Cochrane Database Syst Rev 2005;18:2.
. The 1982 revised criteria for the classification of systemic lupus erythematosus. Arthritis Rheum 1982;25:1271–7.
. Incidence of post partum thrombosis and preterm delivery in women with antiphospholipid antibodies and recurrent pregnancy loss. J Rheumatol 2007;34:992–6.
. A new and improved population-based Canadian reference for birth weight for gestational age. Pediatrics 2001;108:E35.
. High thrombosis rate after fetal loss in antiphospholipid syndrome: effective prophylaxis with aspirin. Arthritis Rheum 2001;44:1466–7.
. Prospective observational study of bone mineral density during pregnancy: low molecular weight heparin versus control. Hum Reprod 2004;9:1211–4.
. Long-term dalteparin in pregnancy not associated with a decrease in bone mineral density: substudy of a randomized controlled trial. J Thromb Haemost 2007;5:1600–6.
. Bone density changes in women who receive thromboprophylaxis in pregnancy. Am J Obstet Gynecol 2006;195:1109–13.
. Management of recurrent early pregnancy loss. ACOG Practice Bulletin No. 24. 2001;24:1–8.
. Fetal outcome of lupus pregnancy: a retrospective case-control study of the Hopkins Lupus Cohort. J Rheumatol 1993;20:650–6.
. Hughes syndrome: the antiphospholipid syndrome – a clinical overview. Clin Rev Allergy Immunol 2007;32:3–12.
. Prevalence of inherited thrombophilias in women with unexplained recurrent pregnancy loss. Arthritis Rheum 2002;46 SupplS231.
. Thrombophilic disorders and fetal loss: a meta-analysis. Lancet 2003;361:901–8.
. Evaluation of the association between hereditary thrombophilias and recurrent pregnancy loss: a meta analysis. Arch Intern Med 2004;164:558–63.
. Repeated fetal losses associated with antiphospholipid antibodies: a collaborative randomized trial comparing prednisone with low-dose heparin treatment. Am J Obstet Gynecol 1992;166:1318–23.
. Antiphospholipid antibodies associated with recurrent pregnancy loss: prospective, multicenter, controlled pilot study comparing treatment with low-molecular-weight heparin versus unfractionated heparin. Fertil Steril 2005;83:684–90.
. Antiphospholipid antibodies (APA) and recurrent pregnancy loss: treating a unique APA positive population. Human Reproduction 2002;17:2981–5.
. Prophylaxis for venous thromboembolic disease in pregnancy and the early post natal period. Cochrane Database Syst Rev 2002;2:CD001689.